You don’t have to make bread to understand Paul’s command, but knowing about it could help. His list of ingredients to avoid and to use is just as important for us today. 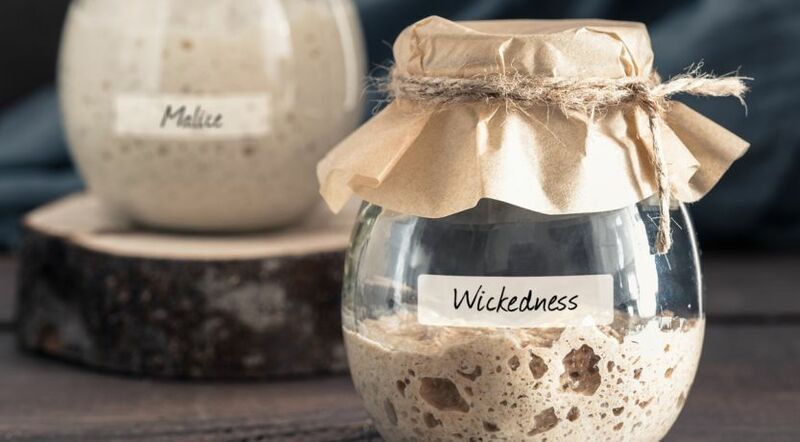 Paul identified two spiritual ingredients to remove from our lives: “the leaven of malice and wickedness” (1 Corinthians 5:8). There are two kinds of bread in the world: the puffy kind and the flat kind. Okay, you bread experts might say that’s oversimplifying, but the point here is to understand what the apostle Paul said to the Corinthians. It’s a command God had recorded for us, because it applies just as much today—if we understand it. Puffy bread generally gets big because of yeast or other leavening ingredients. Flat bread, in general, is flat because it isn’t leavened. The brethren in Corinth understood this about bread. They also understood it on a deeper level because they celebrated the biblical Feast of Unleavened Bread. We know from the context that the Christians in Corinth—both of Jewish and gentile background—were celebrating this festival. Paul warned the Church members not to be “puffed up” with pride because of their tolerance of a terrible sin (1 Corinthians 5:1-2). Then he compared this puffing up with bread. “Your glorying is not good. Do you not know that a little leaven leavens the whole lump [of dough]? Therefore purge out the old leaven, that you may be a new lump, since you truly are unleavened. For indeed Christ, our Passover, was sacrificed for us. “Therefore let us keep the feast, not with old leaven, nor with the leaven of malice and wickedness, but with the unleavened bread of sincerity and truth” (verses 6-8). The Passover is celebrated in March or April (Leviticus 23:5). Paul’s statement confirms that the sacrifice of the Passover lamb foreshadowed the sacrifice of Christ for our sins. The day after Passover began the weeklong Feast of Unleavened Bread (verse 6). By comparing the biblical commands to remove leaven and eat only unleavened bread with Paul’s command, we can understand the analogy we are to learn. During this festival, leaven represents sin and corruption—things we are to remove from our lives. Unleavened bread pictures putting the righteousness of Jesus Christ—the true “bread of life” (John 6:35)—into our lives. Paul specifically identified two spiritual ingredients to remove from our lives: “the leaven of malice and wickedness” (1 Corinthians 5:8). Paul also used this Greek word in 1 Corinthians 14:20. “In malice, be babes, but in understanding be mature.” We don’t want our malice to grow! In fact, babies don’t start out with malice at all—and we should be like them when it comes to malice. “Wickedness” here is from the same word translated malice earlier. We need to be so firmly entrenched in God’s Word that it grows in our minds! Malice can lead to the second ingredient to avoid that we read about in 1 Corinthians 5:8. Wickedness basically refers to evil actions. It’s translated from the Greek word poneria. According to Thayer’s, it can mean “depravity, iniquity, wickedness … evil purposes and desires … wicked ways.” It can even be translated “malice,” and it is a synonym of kakia. Wickedness is progressive and contagious, so you can see why Paul compared it to leaven. In Ephesians 6:12, just before the description of the armor of God, we see the source of wickedness. Paul says we wrestle against “spiritual hosts of wickedness.” Satan and his demons incite wickedness. So essentially, removing malice and wickedness means we are to put away the evil way of thinking and any actions that have been produced by that evil thought process. Acts 3:26 gives the antidote. Peter said that God sent Jesus “to bless you, in turning away every one of you from your iniquities.” The word iniquities here is from the same word translated wickedness in 1 Corinthians 5. So Jesus Christ Himself is the antidote—the One who turns us away from wickedness. So essentially, removing malice and wickedness means we are to put away the evil way of thinking and any actions that have been produced by that evil thought process. Sincerity is translated from a Greek word whose root means “sincere, pure, unsullied, free from spot or blemish to such a degree as to bear examination in the full splendor of the sun.” (The Complete Word Study Dictionary New Testament). This is the opposite of hypocrisy or the malice and wickedness we hide from view. Sincerity is able to stand scrutiny in the full light of the sun. So what does this ingredient of sincerity look like? The apostle Paul out of love warned the Corinthians of the wrong motives of those trying to take advantage of them (2 Corinthians 2:17). Paul, however, approached them with sincerity. “We speak in the sight of God in Christ.” Paul knew that God was watching, and God knew the truth in his heart. We must also remember that God is always watching us. What is the source of this ingredient of sincerity? “Therefore, laying aside all malice, all deceit, hypocrisy, envy, and all evil speaking, as newborn babes, desire the pure milk of the word, that you may grow thereby” (1 Peter 2:1-2). We need to replace malice, deceit and hypocrisy with a genuine desire for the pure milk of God’s Word. Babies are sincere. They tell you what they really feel! But sincerity doesn’t have to be immature. Our sincerity should grow to maturity—not jaded or worldly-wise, but like purified silver reflecting God’s character perfectly, not only on the surface, but to the heart (Malachi 3:2, 3; see point 4 of “4 Spiritual Laws That Are as Important as Gravity”). Along with sincerity, we also need the unleavened bread of truth. What is truth? In John 17:17 Jesus prayed, “Your word is truth.” God’s recorded Word—the Holy Bible—is our source for truth. But Satan has done an incredible job of deceiving and blinding the whole world. As Isaiah said, “Truth is fallen in the street, and equity cannot enter. So truth fails [is not found]” (Isaiah 59:14-15). We must be filling our minds and hearts with God’s Word through daily personal Bible study (2 Timothy 2:15). It takes diligence, planning and stick-to-itiveness to make regular study not just a habit, but a productive habit. The Word of truth corrects us and equips us and makes us wise for salvation (2 Timothy 3:14-15, 16-17). Paul also warned that we must believe and love the truth in order to not be sucked in by the powerful and alluring deceptions of the end-time false prophet and the beast power (2 Thessalonians 2:9-10, 11-12; Revelation 19:20). The antidote to the antichrist is the love of the truth! So we need to be adding truth to our lives. We have looked at two deadly spiritual ingredients we have to remove from our lives—malice and wickedness. And we have looked at two healthy spiritual ingredients we need to add to our lives—sincerity and truth. We can learn a lot by studying these ingredients and preparing an unleavened menu that will be spiritually healthy and delicious—and pleasing to the Master Baker, our great Creator God! Some of the characteristics of yeast help us understand Paul’s analogy in 1 Corinthians 5. Invisibly. “Just one gram holds about 25 billion cells” (Exploratorium.edu). Deceptively. Even if you don’t know yeast is there, if the conditions are right, it can be multiplying exponentially within the dough before you see any signs. As it feeds on the sugars in the dough, it spreads to pervade the entire batch. Powerfully. Over time, the result becomes obvious. At around 80 degrees Fahrenheit, yeast in dough produces enough carbon dioxide to puff the dough up to double its volume in 1 to 1½ hours. Sin, in similar ways, can work invisibly, deceptively and powerfully to corrupt our lives and the lives of those around us. What Is Leaven and What Does It Picture?